Hello cat lovers! Get ready to go ga-ga over this post, because I’m sure you’re going love it. I present to you the Meow Oven Mitts! *welcome music plays in the background in cat voice* Oven mitts are a must in every kitchen but that doesn’t mean they have to be boring. Now you can jazz up your usual oven mitts with something new and unique using this free Meow mitts sewing pattern. And now that we have honored this post with our furry friends’ dance, let’s have a look at the mitts! Tada! Unfortunately, I don’t have a lot of pictures for it because I’ve already gifted it to my mom and I made this project several months ago. The mouth of the cat opens up like an alligator so your thumb would go in one flap and the rest of the fingers in the other. Although it would require some time to cut and embroider the kitty face, but it’s definitely worth it to get something totally unique that you wouldn’t find anywhere else. Won’t this just make a perfect gift? Plus the sewing pattern ins completely FREE. Want to get the pattern? 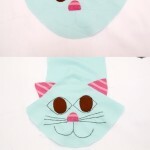 Get the FREE sewing pattern for Meow Oven Mitts on my (affiliate link) Craftsy shop here. Oh I love this adorable cat design! Your tutorial is GREAT!! I’d love to invite you to my blog where you can submit your tutorials for a dedicated post! I pin to many pinterest boards and share on social media! great project idea. I look forward to making at least a couple of these for Christmas presents. Great! Don’t forget to share your picture on our Facebook page.